Our Caithness Branch recently raised the funds for 10-year-old Wally to undergo a vital operation on an ear infection he picked up while he was living on the streets. The procedure was a complete success but it did leave him deaf. Now fully-recovered, Wally has a lovely home with owners who can cater to his needs, on a farm with a view overlooking the sea. But just how differently do we need to treat cats with disabilities? The truth is, whether they were born with a disability or developed one later in life as a result of an accident, disease or old age, cats are very good at adapting their lifestyles to cope with their new circumstances. 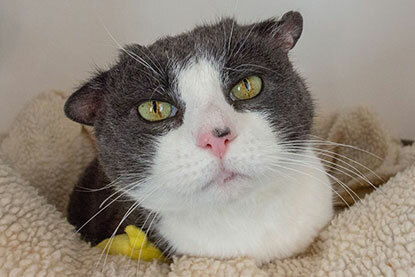 Along with losing their hearing and sight, cats’ mobility can also suffer, either from the lack of a limb or from conditions such as cerebellar hypoplasia which can cause uncoordinated movement. Here are a few suggestions on how to look after cats with these disabilities. Like humans, many cats gradually lose their hearing as they get older. Others are born deaf or suffer hearing loss suddenly as a result of illness or injury. Deaf cats can compensate for their lack of hearing so well that it’s sometimes difficult to tell they have a disability. Cats can be born with blindness, it can develop gradually or it can arrive suddenly as the result of a trauma or illness. Cerebellar hypoplasia is a condition that occurs in kittens as a result of interrupted development of the brain. It causes uncoordinated movement and those affected are often referred to as ‘wobbly kittens’. While it’s possible for cats to be born with three limbs, such a condition is usually the consequence of illness or injury. While getting around on three legs can take some getting used to, cats can usually adjust to the impediment remarkably well. 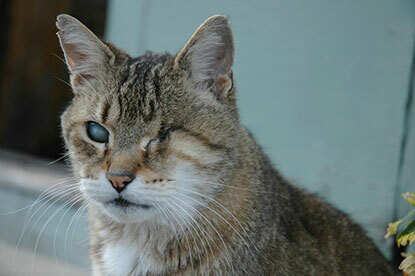 For more information on how to care for cats with disabilities, see our Cats with disabilities Veterinary Guide. The link to the veterinary guide in broken. Thanks for spotting that and letting us know - it should now be fixed. I have an awesome infographic on pet care I'd like to share with you. Do you have an email where I can reach you? Very interesting info- we will be getting another cat(s) at some point and we had talked about a cat with special needs! Thank you- very reassuring!